Surgery is not only the best and most durable way to loose weight but can also cure many diseases such as diabetes and hypertension. Diet and exercise alone often do not offer long term lasting weight loss. This can become discouraging and results in weight regain along with additional gain. This cycle can destroy the metabolism and promote the development of obesity. Approximately 70% of the US is overweight or obese. Obesity is a disease and a chronic inflammatory state that affects every system in the body. Many people develop diabetes, hypertension, heart disease, GERD, and arthritis. Obesity also causes fatty liver disease which can progress to the need for liver transplant. Obesity also increases the risk of developing many cancers. Surgery can alter the hormonal regulation of the body and improve metabolism. These metabolic surgeries can cure diabetes even before weight loss. Surgery can decrease the risk of developing cancer and cardiac events and prolong longevity. 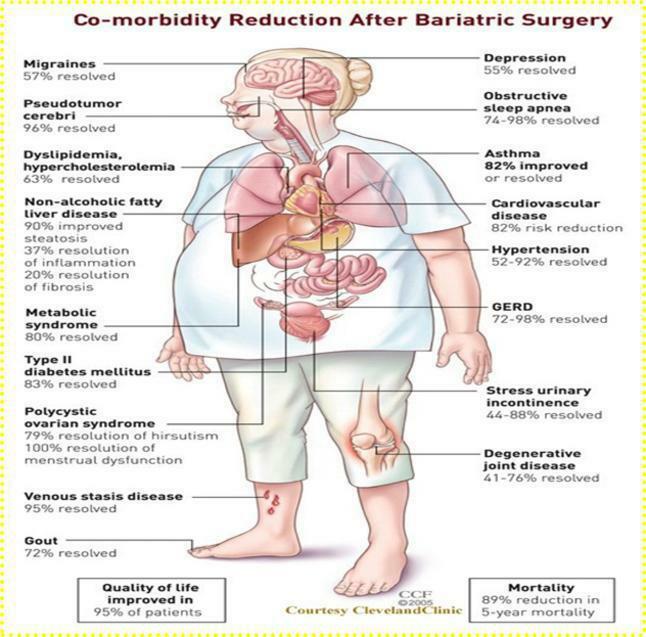 Bariatric surgery is not the easy way out! There is no magic pill to cure obesity. The entire process takes commitment and lifelong lifestyles changes.